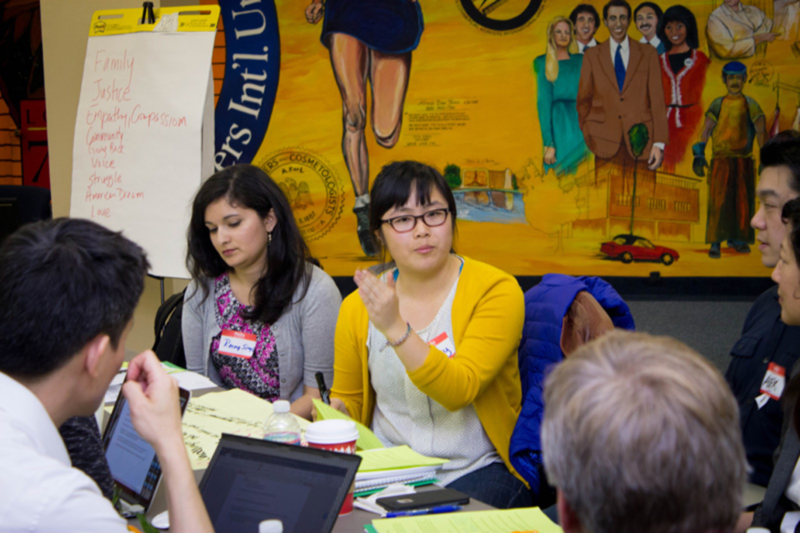 We convened stakeholders from across the country including grantees, special guests, coaches, and donors on January 19-20, 2016 in Los Angeles. Attendees had the opportunity to participate in peer learning activities, workshops and discussions to bolster their skills, deepen their knowledge of the field, and strengthen networks amongst each other. A highlight was an engaging dinner plenary featuring Taeku Lee (Political Scientist and Professor of Law at the University of California-Berkeley), John Chiang (California State Treasurer), and Maria Elena Durazo (International Union Vice President for Civil Rights, Diversity and Immigration, UNITE HERE). Moderated by Cathy Cha of the Evelyn & Walter Haas, Jr. Fund, the speakers highlighted the past and potential future impact of AAPI civic participation, underscoring the importance of work of local groups on the ground. The convening included skills building workshops on Integration and Base Building, Volunteer and Leadership Development, Election Campaign Basics, and Power Mapping.